So I searched around a bit and mostly found dead ends, that did not help but on Microsoft forum I found a solution and that is increasing Virtual Memory on your Windows PC. Now you might be imagining what is virtual memory in a Windows PC, A virtual memory is something similar to RAM that stores the data on your hard disk (Hard Drive / HDD) temporarily and process it and later on delete it, in simple term its a RAM on Hard disk. 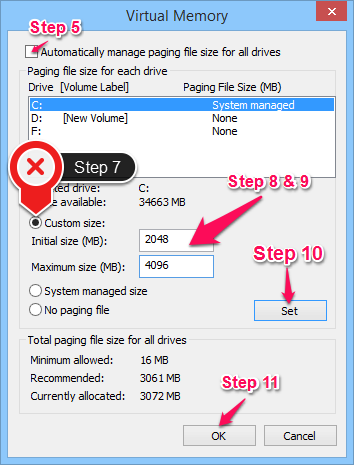 I hope this might have helped you in solving your 100% disk usage problem in Windows 8, if it failed then please let me know that this solution did not work for you so that I can discover a new solution because this problem can also persists because of different other reasons Such as : Faulty Hard Drive or Hard Disk is fragmented. if Hard Disk Fragmented then use Windows Disk Defragmenter tool for fixing it.